Play is extremely important for all dogs. It is a source of exercise, both mentally and physically. Play helps to form and strengthen the bond between family members and their canine companions. A lack of sufficient stimulation, including exercise and play, can lead to behavioural issues with your pup. a well exercised dog is more often than not a happy and relaxed dog. Here are a few suggested playthings that your pups will enjoy. This is a very useful toy from the perspective of exercising your pup with exciting throwing, chasing and retrieving games. Because they float, they can be used to encourage a dog to swim in safe water (always under close supervision) – this is, probably, one of the best all over body workouts (and fun play) for a dog. Using two of these at a time (I sometimes use two balls with my current dog as a change) makes chasing and fetching much more fun. For dogs proving difficult to train to recall, this can be a useful toy to encourage the recall. On return, the behaviour is reinforced (primary) by either, throwing the second toy after release of the first or, rewarding the return with a tasty treat (secondary reinforcer) and the throwing of the second toy. One last point with the Safe Stix is that there have been many reported injuries suffered by dog when playing with wooden twigs and small branches — these are a much safer alternative. Designed for throwing and tug games. I have used these with a variety of different dogs, from large breeds to small. From the dog’s perspective these are very stimulating, they allow for interaction between the dog and the owner — what dog doesn’t enjoy a little tug of war? Although, this type of toy is frowned upon by some, arguing they can promote overly competitive and, sometimes aggressive behaviour; this may have some credence if used without care, generally I find them to be beneficial for the dog. 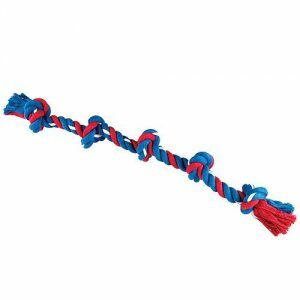 If tug games are structured properly, with a start and a finish, they provide an effective outlet for competitive play, in the puppy and the adult dog. Following a session of tug, the puppy should release the toy, it is then thrown and the puppy encouraged to fetch it to have another session of tug. Playing search and find with the puppy using the toy will encourage to the puppy to seek it when he has the urge to play or chew. Care should be taken when establishing this type of behaviour. Allowing the puppy to chew other items, such as old shoes, will result in a dog that cannot distinguish between what is suitable to chew and, what is not. This is a fantastic exercise for those dogs that like this sort of activity. It provides a high level of aerobic activity. Be sure to get one, such as this, that is specifically designed for dogs. My dog came to me with a hard plastic human version — she wouldn’t touch it. This — she loves — exhausted after chasing and jumping for it. Highly recommended. 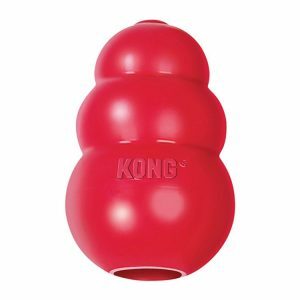 The classic kong toy. 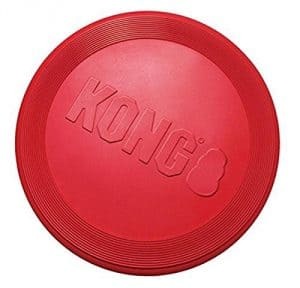 Used by filling with tasty items that require the dog to solve how to release the treat for the reward. This can provide long periods of engrossing activity for the dog. This is not just fun for most dogs, it can be very useful in dogs with separation anxiety, the tendency to chew inappropriate items and, perhaps, helpful with dogs exhibiting some signs of stressful and repetitive behaviour. Obviously, this is just a few examples of the thousands of toys available out there. They provide a pretty good starting point.